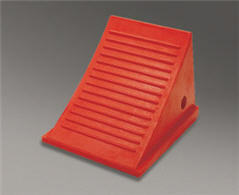 Urethane Wheel Chock 7.5" x 11" x 8"
1500 Series Urethane Wheel Chocks are designed for over-the- road trucks and trailers. They are strong, safe and lightweight. Impact absorbing chocks grip tire and road, will not cause tire or pavement damage and are oil and chemical resistant. For added safety and convenience, these wheel chocks have "How to Use" guidelines molded directly into the chock. This model weighs 6 pounds and is 33% more dense than Model UC-1500-4.5. It is incredibly durable due to the quality of material and innovative design.